My Kids Have an Early Bedtime. Here’s Why! “Your son’s in bed when it’s still light outside?” someone asked me incredulously. I know some of my parenting choices aren’t the most popular, but my husband and I have made our decisions based on what we think is best for OUR kids. Putting our kids to bed early is just one of the daily parenting decisions we’ve made for every child. We’ve stuck to it, believe in it and have only seen positive effects from it! It might not be the best scenerio for your family, but it works for ours. We also set five boundaries for our marriage because it’s the most important relationship in our lives. Those boundaries help safeguard our marriage…just like our parenting choices help safeguard our kids. When I found out I was expecting my first son, I rushed to the library and checked out every book on pregnancy. I subscribed to every pregnancy magazine and spent months preparing for pregnancy, labor and delivery. But seconds after my son was born, the reality set in. He’s depending on me for everything. And I don’t know ANYTHING about being a mom. But those little hands, tiny feet and tiny cries reached a part of my soul that I never knew existed. The mama bear part of my soul was absolutely determined to give my child the best childhood he could possibly have. And good, quality sleep was a huge part of that. But that’s only a tiny part of the why-my-kids-go- to-bed-early puzzle. Let’s dig in and find out why I’ve made this choice for every single child. And have never, ever regretted the decision to put my kids to bed early. It’s medically proven to be better for their health. This article has the best information on how many hours of sleep your child needs per day. Making sure my kids get enough sleep is just as important as taking them to well-baby checkups, brushing their teeth and giving them vitamins. I’ve always guarded their bed and naptimes…even when family members and friends were visiting our home. Side note: we do make exceptions for holidays, family fun nights, vacations and late church nights. 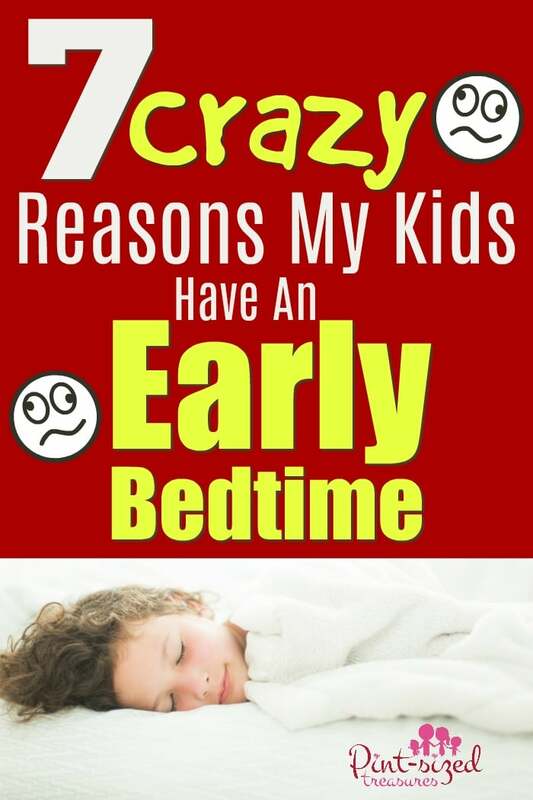 But, the normal bedtime for my kids is 8 PM until they turn 13 years old. Plus, kids under the age of six take a daily, two hour nap. I think this is one reason why my kids are overall healthy! Earlier bedtimes for the kids also give my husband and I time to ourselves. We homeschool our six kids and both work from home. That means our home always has kids in it. We’re constantly talking, playing, learning, making messes and cleaning. It’s an awesome and full life. But my husband and I also need time to just focus on our marriage. If we have a strong marriage, we provide a more secure and loving environment for our kids. It’s one of the secrets to creating a happy home. And if our kids go to bed at 8 PM, that gives us an average of two hours nightly for ourselves. We can talk without interruptions, have a late night snack and might even watch a Hallmark Mystery Movie. It’s just a small way to unwind at the end of the day…together. Early bedtimes help my kids wake up earlier. Our school day starts between 7:30 and 8 AM. But before we start school, we have to clean bedrooms, make breakfast and get dressed. If the kids stay up too late, they’re groggy and dragging in the morning. 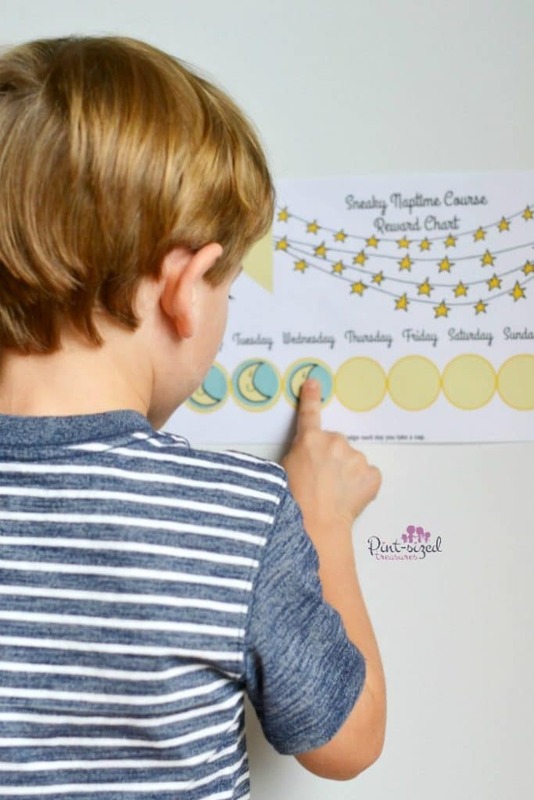 If they follow our family’s bedtime routine and schedule, they’re more refreshed and ready to face the school day! A set bedtime keeps the kids on a routine. Routines are awesome for our peace of mind. Routines provide security to kids and parents because we always know what’s coming next. No one whines and within 20 minutes our house is quiet and our kids are resting. It truly helps calm the chaos! Sticking to an early bedtime instills healthy habits. Unhealthy habits are tough to break! I personally like to help my kids learn good habits before bad habits have an opportunity to form. Optimum sleeping hours is just the beginning of heallthy living. My husband and I encourage our kids to limit junk food, pile on the veggies and play outside on a regular basis. We also limit their screen time and they eat very little candy. We’re hoping that teaching them basic, healthy habits at home will help them avoid developing bad health habits in the future! Almost every time I’ve seen my family doctor he’s asked me, “How many hours are you sleeping at night? Are you sleeping at least eight, uninterrupted hours?”Another doctor emphasized to me that I need good “quality” sleep. Teaching our kids to go to bed early at an early age will create healthy lifestyle habits that I hope will follow them through their college and adult years. Because we all know how tempting it is to stay up late, watch our favorite movies, text freinds, scroll facebook and eat chocolate. Maybe, just maybe, I can help my kids avoid falling into the unhealthy pattern of late nights and junk food…not that I ever do that or anything..ha! It helps them make better decisions during the day. This is an interesting read on the effects of poor sleep and the decision making process. It suggests that poor sleep, several nights in a row, decreases mental performance to the same extent as drinking enough alcohol to have a blood alcohol content level of 0.06. That same article suggested that lack or sleep can lead to a less productive day (that’s kind of a duh) and a more negative attitude. Definitely one reason why your toddler can be cranky! Our kids not only have early bedtimes, but they also routinely take naps (two hours long) from ages six months to six years old. They naturally become sleepy at 12:45 and are quietly snoozing by 1 PM. 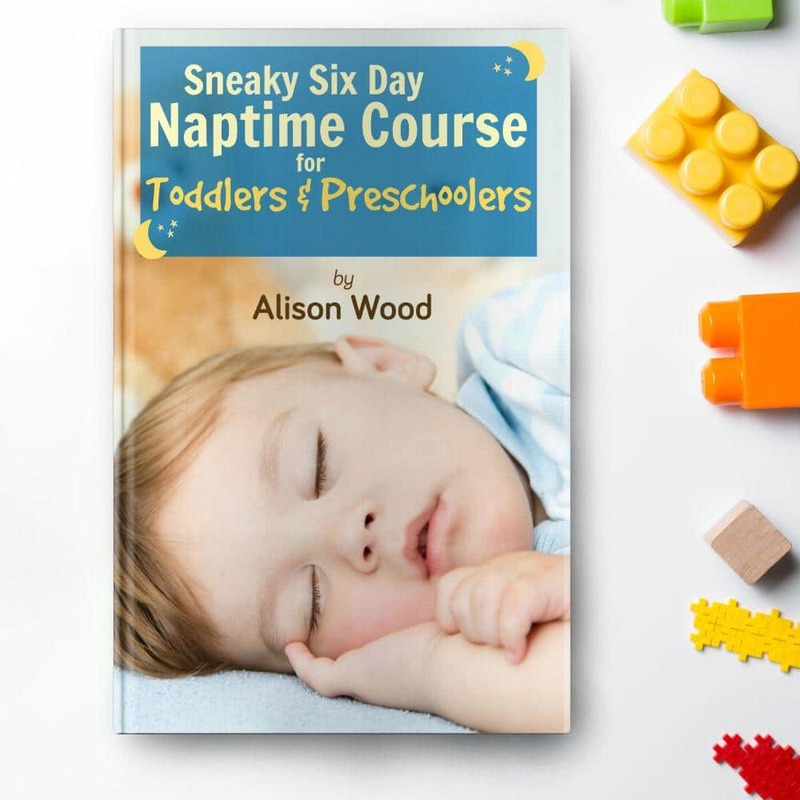 And I share more about this in the Six Day Sneaky Naptime course for toddlers and preschoolers! It’s fun for the kids and gives everyone a happy, more energetic day! Check out our Six Day Sneaky Naptime Course Here! Choosing an Early Bedtime for the Kids Gives Me Time to Catch-up! If I try to accomplish all my mommy and business tasks during the day, I can easily lose focus of spending one-on-one time with each child. I can get stressed because I’m behind on the laundry or haven’t sent out business invoices. I can spend too much time tidying during the day instead of playing with the kids. Knowing that I have a few hours in the evening to myself, helps me focus on making fun, heart-to-heart moments with my kids during the day. It’s completely ok that there are two baskets of laundry waiting to be folded. The folding magic can can happen at 8:30 PM. No stressing about the article I need to write…that can happen at 9 PM. 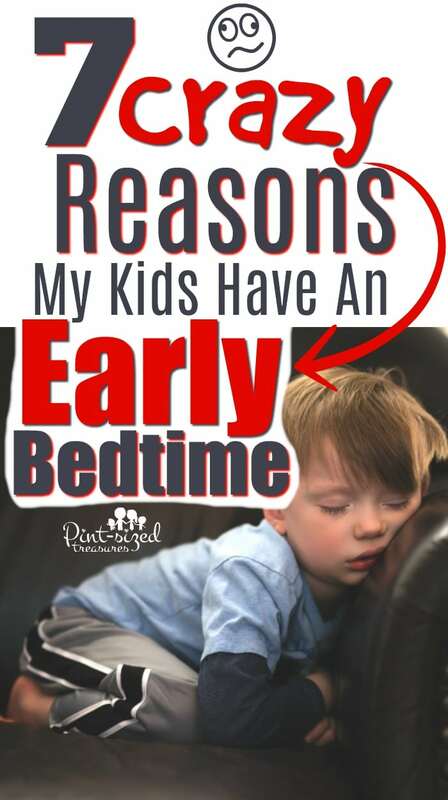 An earlier bedtime helps my kids enjoy a less-stressed and more focused mom…it’s a win for our entire family! I’m interested to hear your family’s set bedtime! Do you put your kids to bed early? Let’s chat about being moms in our All Things Mommy Group on Facebook! See you there!